Which Figures Are You Most Looking Forward To? Discussion in 'Action Figures' started by Fozzie, May 31, 2003. Hmmm...which one out of all the annouced ones? Gonzo with the new head sculpt is probably number one for me right now. MTI Sam might be a close second. Then again Statler and Waldorf are really cool looking and those chairs should be awesome. Clifford looks good too with the new proportions and I can't wait to see the paint job. Beau is an awesom likeness, though I don't like him comming in his jacket instead of the all flannel shirt. Janice looks cool, but not one that I'm all that excited about. Probaly because of the lack of articulation. Pepe looks awesome, and so does Vaca Pepe. I can't forget Koozebane Kermit and BOP Fozzie, they rule! Rizzo- he will finally show scale (A really big diference in scale) to my other Muppets plus he looks very good especially with the Poop-in action. Clifford- i'm a big fan of purple and he's so diffent he's like Uncle Deadly from TMS but for MT. - Vacation Pepe - If they can sort him out so it looks a bit more wilder and in his character. - Bear On Patrol Fozzie - Cool sculpt, cool accessories ! - Tutu Pepe - Must be a lacy pink 'Barbie' matierial tutu though to get the right look, exact film costume - not sculpted plastic. I'd definitely have to follow the trend, with Purple Tux Gonzo at the top of my list, with the show-accurate costume, amazingly accurate new head-sculpt, and the fact that he's always been my favorite Muppet. Next is Janice, rounding out the band, then Statler and Waldorf, though I wish their faces were fixed a little, to look more like the original show incarnations, as opposed to the more modern looks. Gonzo's facial seems to have made an amazing difference in character-accurate likenesses, and is it just me, or did Janice's face look more like the puppet in those new unpainted shots, too? Maybe Jamie or someone could use good old Photoshop to get S & W with the faces they deserve. Oh, speaking of which, are those original Gonzo pics available??? I'd sorta like to see what inspired the re-sculpt. Thanks a lot. Take care. Beau, Pops, and Tux Teeth are REALLY high on my list of wants. 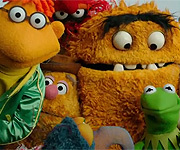 After those, Reg Sam, Reg Rowlf, S5 Gonzo, Janice and Lips (if he ever gets made) are also high the list of must haves. Reportedly, the Statler and Waldorf sculpts were the result of the Henson art department. Ken has stated there is no way to change them. He is aware of all the issues. They're still very good, but I agree there could have been more work on them. Apparently they are locked-in. Let me get some paper and a dartboard. I loooooove tux Gonzo! Finally Gonzo classic suit. And Aerosmith pretty much speaks for me. I'm looking forward to the Sam Eagle as Sam Arrow and the Beauregard figure. Yeah Cody. I'm also hyped up about Bo. 10. and a pack of Penguins Chickens and Things! Haha, Marvin with all those muppaphones would be a great figure. But Im really looking forward to Janice, to complete the EM, and Gonzo + Camilla. You REALLY think anyone would trust you with a dartboard ? Of corse. The darts are the problem. Come to think of it, a Muppet dartboard is coming out. 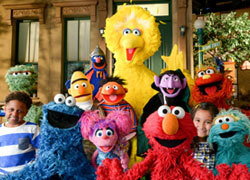 Why would we want to throw darts at Muppets?